Rudy Adrian keeps on surprising the listener with his excellent blend of retro-electronic music and ambient soundscapes. In the USA, people now also had the opportunity of seeing this special musician live because he toured there in 2002. The result, "Concerts in the USA", contains perhaps the best music the New Zealander has produced until this moment. The CD opens with "Japanese Garden" with beautiful atmospheres, which accompany Rudy’s dark voice and a big, Vangelis-like, solo. Then the sequences enter the music in "The Donner Pass Rail Corridor". They become heavier and heavier as the piece further progresses and Adrian gets the chance to put in even more solos. After more atmosphere and Nick Prosser’s baroque flute in "Rocks and Junipers", the sequencers return in "Alpine Meadow", an intriguing track with again, great soloing. "Island Of Pirates" opens with loops after which another beautiful quiet composition emerges. "Evening's Last Sequence", a recording from "The Gathering" festival in Philadelphia, does its title justice because it has a wonderful solo. "Turquoise Drift", a very warm and intense number, is the only piece which is not performed in the USA but in New Zealand. With "Concerts in the USA" Rudy Adrian has definitely placed himself in the top of electronic music. 2003. Paul Rijkens Zoals gewoonlijk voor Rudy: Schitterend!! George / NL Another fine release of music by Rudy once again. Great ambient atmospheres, and excellent sequences. The guy flat out is a synth wizard, without a doubt Rudy has alot of passion for his music, as you can listen for yourself. 2003. Mike V. / U.S. This is Rudy’s version of what Steve Roach did a few years back with his On This Planet CD. Roach had just finished touring, but rather than just take raw live recordings, he went back to the studio and made music that captured the feeling he had while on the road. That is exactly what Rudy Adrian has done with Concerts In The USA. It is his studio interpretation of his impressions of America and its natural beauty. For example, the opening track "Japanese Garden (Portland, Oregon)" evokes images of that serene place in my hometown, but the music isn’t exactly what I recall hearing in Paul Ellis’ living room in September 2002 when Rudy played there, although it is similar. I recall him using his voice as an instrument as he does here. In fact, I remember being surprised how often he uses vocals, processing them in such a way that the resulting smooth tones could easily be mistaken for synthesizers. This album is similar to Adrian’s Sequencer Sketches CDs, perhaps a touch mellower. If you've enjoyed those, then you'll have to get this one, too. Though there is a strong familiarity of this CD to those gone before, there is also a sure handedness to it that comes from all that prior experience. He is fully in his element, the playing is confident and assured. He doesn't have to do over-the-top synth histrionics, he just relaxes and really lets the music flow. This CD has some great sequencing as usual, but it carries along at a luxurious pace that is serene and soothing. You need go no further than "Donner Pass (Sierra Nevada, California)" to hear what I mean. Yes, there are hypnotic sequencers, but the music is so cool, calm, and utterly peaceful. Though the Berlin school style is evident on several tracks, about nearly half of them rely fully on atmosphere, with no real rhythm or sequencing at all, just blissed-out space music. What can I say, another brilliant album from Rudy Adrian. 2003. Phil Derby / Electroambient Space Like many instrumental keyboardists travelling has provided New Zealander Rudy Adrian with a rich source of inspiration. While the pieces here were played during his 2002 US tour (with help from various local musicians) this is not the straightforward live document the title might lead you to expect as the versions you hear on the album were actually re-recorded back in NZ under conditions as close to the gigs themselves as he could get, including the fact that each piece was 95% improvised. It might sound an odd way of doing things but hardly matters in the end as the inspirations and feelings behind the music still come through loud and clear. Adrian's music has always had that sequential base that is inspired by the German artists of the 70s but he has used this as a springboard to his own unique musical visions. In this case, this has been mixed with skillful use of varying sound sources that manage to bring the American wilderness to life. This is demonstrated by "Donner Pass" which is quite appropriate given that it was originally played in the Sierra Nevada or the excellent "Rock and Junipers" where Native American samples back the totally modern synthetics to perfectly evoke the environment where the original concert took place (Arches National Park in Utah, in this case). Likewise the opening "Japanese Garden" ably evokes it's title, although it's relative brevity, at just under 5 minutes means it acts more an introduction to the main body of the album. Each track fades into the next which gives the album the feel of a complete musical 'suite' and provides some memorable atmospheric moments, not least when the haunting choir samples that grace the melodic "Island Of The Pirates" (where, I must confess, I can see no link between the melodic music and the title!!) carry over into the sequential "Final Sequence", giving the piece a nice evocative feel. Like those used on "Rail Corridor" the sequences are phrased just right to give the pieces the impetus they need, no hint of plodding here which is, of course, another point in Adrian's favour. Music like this is often said to be an imaginary soundtrack and indeed the music does form pictures in your mind, making for quite an evocative mental travelogue. Adrian proves himself to be a quality musician once again on this release, forging his own musical identity all the while. 2003. Carl Jenkinson This album gives us the wonderful opportunity to listen to the live music by Rudy Adrian. A series of performances that this composer gave in various cities of the United States during a mini-tour in the year 2002, are the basis for this CD, which gathers some of the best moments of a live event. In these concerts, where the artist played solo or with other musicians, we perceive all the basic traits of his style, although with an instrumental approach much simpler than in his studio recordings, which is due to the needs of live performances and to the premise that Rudy Adrian has of not resorting to pre-recorded or pre-programmed material when he plays live, as well as avoiding great ensembles of performers. The result of the experience reveals some little known aspects of the style of Rudy Adrian, and allows us to appreciate better his performing skills as well as the freshest, most vital aspects of his music. 2003. Jorge Munnshe Following the example (either coincidentally or on purpose) of Steve Roach, who did much the same thing with his On This Planet release, New Zealand Rudy Adrian re-recorded the music from his recent concert tour of the US and has released these tracks as the album Concerts in the USA. Aiding the listener in assimilating this as "live" music are the liner note annotation of where the particular tracks (there are seven) were initially played (locations include Portland Oregon, Arches National Park in Utah, and Philadelphia, Pennsylvania). The resulting album is less rhythmic-driven than some of Adrian's other releases, being more textural and drifting instead, something that I think Adrian does just as well as his sequencer-laced beatfests. That is not to say that rhythms are absent from this CD. But to my ears, the emphasis is on either the more spacy side of the artist's keyboard work or the more subdued use of rhythms and the more evocative approach of his previous efforts. Opening with the short wordless vocal-enhanced "Japanese Garden" (less than five minutes long) the album soon moves into more familiar neo-Berlin soundscapes, both spacy and rhythm-dominated. "Donner Pass" is forlorn yet dramatic as it evolves from an ambient opening into a sunshower of twinkling bells and sequenced pulses and builds into a classic slice of neo-Berlin with the requisite Adrian twist. The chattering beats give way to an undercurrent of flowing synths in "Rock and Junipers", a step back into drifting spacescapes, enhanced with plaintive wooden flute and Geodesium-like wood drum/kalimba samples (circa that artist's overlooked album, Anasazi). "Rail Corridor" is my personal fave on the album, opening with subdued but insistent pulsing sequenced synth beats amid whistling keyboards (evoking comparisons to my preferred Tangerine Dream era, that being the Risky Business soundtrack time period). As the piece unwinds into the next track, "Island of the Pirates", it once again settles into a sedate and floating mood, amidst washes of keyboards, bell tones and overtone chants. The album ends with what may be Adrian's most minimal piece ever recorded, "Turquoise" (location-wise, it is annotated as Dunedin, New Zealand). Arrhythmic upper-register bells twinkle while serene keyboards gracefully caress the song, building only slightly in pace as the track progresses. It's a classic slice of spot-on perfect spacemusic, the melodic elements floating almost effortlessly, creating a spaciousness that brings this excellent album to a fitting close. Over time, Rudy Adrian has revealed himself to be one of the brightest stars on the EM horizon. Concerts in the USA offers what would appear to be proof that hearing him live is just as magical as listening to one of his CDs. Per the liner notes, Adrian went to exacting detail to recreate the sound of a live concert. In that case, I'm sorry I didn't hear him when he graced our shores. Seldom does a Germanic-EM artist so expertly and artistically blend the rhythmic with the drifting side of that genre. I have long maintained that Rudy Adrian was under-appreciated. I hope that this album will finally reverse that trend and give this artist his due. Highly recommended ­ especially to those who normally find Berlin school music too frenetic, as this CD is more laid-back than the typical sampling from that genre. 2003. Bill Binkelman / WindandWire This CD from 2003 features 62 minutes of live electronics recorded on New Zealander Adrian's 2002 tour of the United States. Adrian's electronic music tends to run on the atmospheric side, employing tranquil textures to create soundscapes of ambient demeanor. Although this profile fits many of the tracks on this live release, there are frequent instances of substance rising from the mysterious sonic mists. Passages of heavenly stature, lilting with a Vangelis flair, embellish the fragile compositions with tender melodies that evoke an intense longing and geological loneliness. As the music progresses, its ambient qualities become submerged in a density that employs livelier riffs and more stratospheric harmonies. Even when the tuneage reverts to more tranquilized terrain, the melodies carry a somber power that transcends their apparent serenity, stirring sentimental connections between the listener and their environment. Each track is culled from a different concert, defining location through a musical study of indigenous locales, as in the flutish portrait of "Rock and Junipers" from the Arches National Park in Utah, and the urgent sequencing of "Rail Corridor" from his Rocky Mountains performance. The final track on the CD comes from one of Adrian's homeland concerts, providing an exotic contrast to his sonic interpretations of the American scenery. 2003. Matt Howarth This cd quite rightly is not titled "Live in the USA". The story is that all the songs have been performed live during Adrian’s tour through North America in 2002 but that after he returned home, Rudy discovered these songs could not stand on their own without the video images he showed during the concerts. Therefore he decided to rerecord every track and retitle the cd to "Concerts in the USA". The music has a high new age calibre (with hints to the early Klaus Schulze), without doubt inspired by the beautiful surroundings of America’s nature parks. This means many tranquil synthi sounds with Indian flute. During the second track ("Donner Pass") the sequencer drops in halfway which also happens in track four ("Rail Corridor", the best song of this cd) and track six ("Final Sequence") giving these numbers some pace and sting. Nice record for the Sunday afternoon. André de Waal / SonicImmersion.org In September of 2002, Rudy Adrian performed several live concerts throughout the continental United States (most notably among them, his appearance in Philadelphia at The Gatherings Concert Series on 21 September 2002 followed by a live in-studio radio concert on STAR'S END). This ambitious tour took Rudy Adrian "around the world" both in terms of literally circumnavigating the globe and in personal life experiences. It is often said that, "travel broadens the mind" and after this trip of a lifetime, Rudy Adrian is showing the resulting signs of personal growth and a unique insight into the world - and into his own heart and mind. Living in the near isolation of New Zealand, Rudy Adrian's early music had that "newly hatched blankness" all young musicians enjoy. By getting out into the world, meeting others of his kind and essentially challenging himself to grow, Rudy Adrian's music is now enjoying new dimensions of character and maturity. Concerts In The USA includes definitive studio versions of pieces performed live - arranged in a rationale consistent with album length listening. More important, this album brings together the total of Rudy Adrian's music. Still sustaining synth pads, overtone singing and native flute solos contrast the activity of interlocked sequencer triplets cycling beneath thick soaring keyboard lead lines. The ambient, reflective realizations flow inward while the focused, melodic, rhythmic pieces lead us on a journey outward through the cosmos. The album engages the listener throughout its entire course. Passing from one phase into another is a beautiful lesson in transition. The result is enchanting. 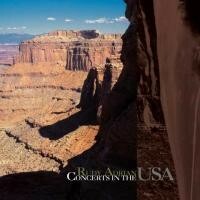 Concerts In The USA is Rudy Adrian's pleasing and sensitive combination of the loam of earthly crust and the vastness of the heavenly firmament.